Client & Wallet Make sure that you encrypt & backup your wallet on a secure computer & another different safe physical location. http://www.cryptobadger.com/2013/05/guide-bitcoin-wallet-security/ is an excellent guide to use. Also do not browse the web under Windows Administrator account, preferably do not use a Windows PC at all for your wallet/s or logging in to exchanges etc, nor the Internet Explorer browser, if you must then at least have installed NoScript, Ghostery, & Adblock Plus, along with MSE & Malwarebytes, Use https everywhere & in settings select "click to play" for plugins, disable autoruns to protect from USB transfer viruses, don't use an old OS & especially not WinXP. Ideally use Linux OS or at least a clean OS install before setting things up, don't click on any random links, even if they look like just .jpg ones, better still get a dedicated machine just for banking etc. Log out of important sites & delete their cookies before browsing to any other sites is an important general rule, or to download VMware player (free) and create a VM that you use to do all of your forum/browsing etc. This way you don't have to have a separate computer yet you are completely insulated from an attack on the VM. coblee's Encrypted Litecoin paper wallets - see reply #4 for detailed instructions. You may also like to consider putting email dead man switches or with your executor in place for encoded private keys or passwords (say to a LastPass account with the recipient/s having activated account Yubi Keys & being advised to expect a mail like this so that it isn't treated as spam), or an M-of-N system. Until you are aware of all this be very wary of how you use sites & forums especially those that are dedicated to Bitcoins, don't browse them from a computer where you have sensitive info, don't click on links there or accept Skype chats, see this thread & onwards. See the DIY Guide, page 12 here for more security info. * As well as backing up the Litecoin wallet if you want long term non-volatile storage then send all coins to a single address, and write down or print out the private key for that address. Shred and delete any digital trace of the key and you're golden. Then type: dumpprivkey <litecoinaddress> to get the private key for any address in your wallet, you can also import them with importprivkey <litecoinprivkey> [label] where label is what you want to call that address. Obviously private keys, like any un-encrypted backups of your wallet, should be stored in a safe or such. http://www.reddit.com/r/litecoin/comments/1qmglq/how_to_import_a_private_key_into_litecoinqt_in/ - This guide may be more up to date for importing private keys to wallets. Mobile wallet for Android: https://play.google.com/store/apps/details?id=de.schildbach.wallet_ltc <--- Recommended! US only atm, shortly worldwide release. Best practice is to enable 2FA via email for withdrawals on btc-e.
Walk-through: Go to your Profile -->​ Edit profile --->​ Security & tick the 'Withdraw only with request on E-Mail' option then click Save. http://bitcoinwisdom.com/markets/okcoin/ltccny - OKCoin - LTC/CYN the largest market by far now, see this graphic comparison. http://coinmarketcap.com - Market Cap of different crypto currencies. Forum & Reddit <--- good for up to date advise, tip & any questions you may have. Free Entry Prizes <--- competition over, prizes claimed. Note that in order to get the most accurate ltc/usd price it is best to use the price on BTC-E for ltc/btc & then the price on Mt. Gox for btc/usd (actually now best to use Bitstamp for a more realistic btc/usd price) as these are the largest exchanges for each of these pairs, atm it is hard to get dollars on to & out of the BTC-E exchange so their ltc/usd price is not accurate. Commission fees for transactions (buys/sells) are respectively 0.2% on BTC-E & up to 0.6% on Mt. Gox, also depending how you deposit/withdraw funds there are fees for this in some cases. Litecoin serves a huge function in the crypto-currency world, because Scrypt based hashing is orders of magnitudes more secure than SHA256. LTC serves as a hedge against any issues with BTC, both in terms of bugs with the software and any sort of attack on the network. Also Litecoin finalizes the 100% anonymity promised by Bitcoin. BTC transactions can be traced fairly easily even if you use a coinmixer. But if you go into another currency, its 100% impossible to trace further transactions. For these reasons I'm very pro-Litecoin and I think it serves to strengthen the cryptocurrency economy rather that weaken it. I believe the desire for an alternative cryptocurrency will be high enough to give it solid value relative to bitcoin, much like a generic ".com" domain name is valued at about 10 times the same ".net" name. If this is, in fact, a correct assessment, Litecoin is almost certainly the top pick for this role. 2013 06 01 Google+ page for Litecoin Project, where important dev news gets posted first. 2013 06 02 Podcast with LTC creator, Charlie Lee (coblee), at about 48 minutes in. 2013 06 21 Mt.Gox confirm adding Litecoins, they expect this to be in July 2013 - this didn't happen though. 2013 08 05 Mt. Gox Status Update including Litecoin implementation confirmed, but no estimated date for it given this time. 2013 09 30 How to get started with litecoin by CoinDesk A great write-up. Perfect info for someone new looking to navigate Litecoin. 2013 10 10 Mt. Gox aiming to be implementing LTC by end of Nov, so at least 2013 is still looking likely/possible. The exchange part is nice, but the most important reason is the LTC/USD payment API. Litecoin on a major exchange will open the doors to the big payment gateways. 2013 10 13 To celebrate the 2nd anniversary of Litecoin, the Litecoin development team will be doing a reddit AMA (ask me anything) at 2pm - 4pm PDT this Sunday. Plenty of positive news in the AMA, lots of developments in the pipeline, plus Charlie saying that he "had plans to persuade Coinbase to adopt Litecoin. Stay tuned... Definitely a possibility. I will do my best to make it happen. No promises and no time frame." "Wild guess here... $12 on Litecoin's 3rd birthday. Based on Litecoin being about 2 years behind Bitcoin. 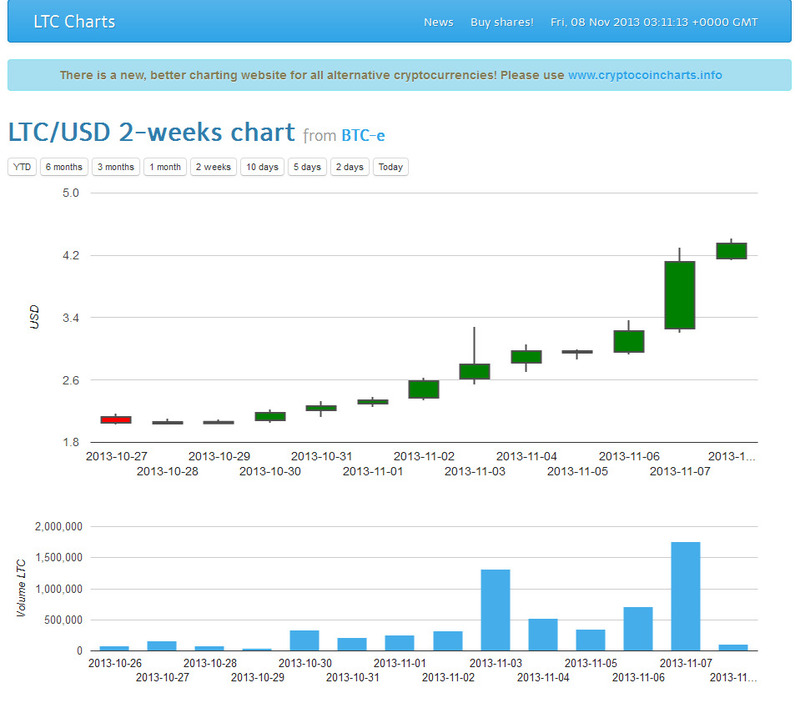 Bitcoin price was $12 on 10/13/2012. :)"
"The price of LTC is pretty much all based on speculation right now. This is similar to Bitcoin about 2 years ago. So I wouldn't worry too much about price. We are working towards keeping the network stable. As Litecoin becomes more popular and grows, there will be more exchange support, more payment processors, and then more merchants. Once we have merchant support, the LTC price will no longer be just controlled by speculation. This might take a couple years or so." "To be clear, I'm not saying it will take 2 years for exchanges or payment processors to start supporting Litecoin. It's just that it will take at least a year before we have enough merchants accepting Litecoin to make the price not just speculative." 2013 10 18 https://vaultofsatoshi.com - Canadian global exchange opens for BTC/LTC trading, good to have an alternative to BTC-E & Bitfinex. 2013 10 18 The Long and Winding LTC Road is Just Beginning. Bobby Lee the BTC China CEO, a rapidly growing exchange for BTC in China, is the brother of Charlie Lee, the founder of Bitcoin’s alternative, Litecoin. The other day, a user "chrystov" had a great comment about litecoin: "I'm definitely keeping my eye on Litecoin as a secondary vehicle. It will never pace up to bitcoin, but I see it as the most viable in the landscape of altcoins, not because its technically superior necessarily, but because of its positioning. Value is an agreed-upon perception validated by a critical mass of market involvement. Litecoin has a good tinderbox signature."